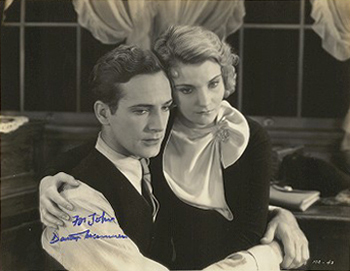 Released the year before Dracula, Mothers Cry co-stars DM and his favorite leading lady, Helen Chandler. Produced at his home studio, First National, the film tells the story of Mary Williams, (Dorothy Peterson) and her struggle to provide a good home for her four children. Widowed at a young age, Mary has her hands full with eldest son, Danny, (Edward Woods) an incorrigible youth who grows into a criminal. Artie, (DM) on the other hand, is a sweet child who becomes a successful architect while Beattie, (Helen Chandler) is an idealistic dreamer and Jenny, (Evalyn Knapp) marries early to raise a family of her own. Being forced to leave town due to his illegal activities Danny eventually returns to wreck havoc on the Williams' peaceful home. Never on good terms with Beattie, he ends up murdering her in a vain blackmail attempt. Mary convinces Artie to leave home, never to return, so as to avoid scandal and the ruination of his hard-earned career. Danny ultimately dies in the electric chair. Mothers Cry is another of the average films DM made for WB / First National. The fact that it stars the male and female romantic leads of Dracula makes it worth seeing. Edward Woods, the co-star of Public Enemy, delivers a caricature performance and his lines and expressions are laid on as heavily as his make-up! and a portion of the sale goes to the David Manners web site. Help support this site with your purchase!